FREEPORT – TEDxYouth@GrandBahama will return for a third year on Wednesday, 06th March 2019. 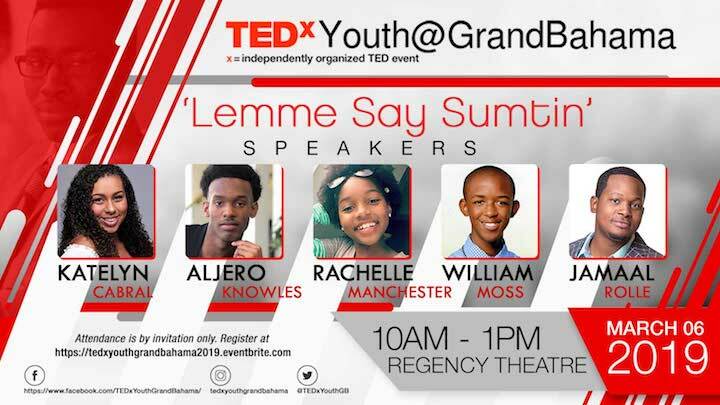 Under the theme ‘Lemme Say Sumtin’, Grand Bahama’s youth will gather at the Regency Theatre to hear several of their fellow students and watch TED talk videos that take a multidisciplinary approach to ideas worth sharing. The event will feature presentations that are idea-focused and on a wide range of subjects; foster learning, inspiration, and wonder; and provoke conversations that matter. “The students organizing TEDxYouth@GrandBahama 2019, with guidance from teacher advisors, have been hard at work over the past couple months to deliver an event by and for them and we look forward to engaging them on this global platform that showcases their individual and collective voices” said Earle Taylor, TEDxYouth@GrandBahama curator. Minister of State for Grand Bahama, Sen the Hon J. Kwasi Thompson will give opening remarks and Bishop Michael Eldon School’s Steel Pan Band, Tabernacle Baptist Academy’s choir, Hinds Feet Dance Academy, and Ms. Francesca Forbes of Jack Hayward Senior High School will perform. “We encourage the broader community to support these efforts by liking and following the social media pages, watching the videos on the official TEDxYouth global YouTube channel and sponsoring the event,” said Katarlah Taylor, TEDxYouth@GrandBahama co-organizer.